Small or LARGE we are here to help. We work with several kinds of entities from small retail shops to large Corporations. A few of our clients have given us permission to let you know who they are, and a little about what they do. 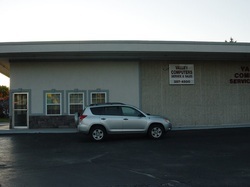 Valley Computers has been servicing clients in and around Salem for the past 15 years. Fast professional services. Check them out on Facebook or click on their image to the left. "Valley Word Church is a Church on the move. Connecting people to God and their destiny in Chirst. Empowering believers of all nations and cultures for success in the home, church, marketplace, and the World." Dr. Eddie Crabtree has a true shepherd's heart for the family of Valley Word Church. Pastor Eddie and his wife Debbie Crabtee, have pastored Valley Word Church since 1995. He is a 1985 Rhema graduate and pastored in Raleigh, NC for seven years before coming to Roanoke. One of his favorite saying's is, "People don't care how much you know, until they know how much you care." To learn more about the Church visit their website, www.valleyword.org or click on their logo above.